Camping on the Frenchman's Cap track is recommended only for experienced walkers who are fully self sufficient. Please note, fuel-stoves only are allowed in this area. If you are walking Frenchman's Cap, you must register from the starting point on the Lyell Highway, which is located app. 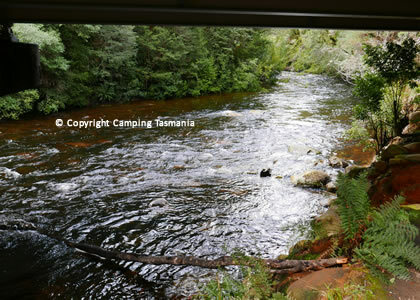 3 kilometres west of the Franklin River Bridge and 30 kilometres west of Derwent Bridge. The start of the Frenchmans Cap bushwalk is 40 kilometres east of Queenstown. The Frenchman's Cap bushwalk takes app 3-5 days to complete, and is strictly only for expereinced walkers. In the towns of Queenstown and Strahan you will find amenities including shopping, bakery, hotel and medical services. Only limited facilities are found in Derwent Bridge. There are other accommodation options in the area. There are two unattended huts along the track which have bunks but no cooking stoves or utensils. The Lake Vera hut accommodates 20 people; Lake Tahune 16 people. It is preferable to use the huts whenever possible in order to reduceimpact on vegetation around campsites. However always carry a tent as the huts may be full when you arrive. Carrying a tent will also allow you to stop due to adverse weather, injury or tiredness. Recommended camping locations are: Camping Franklin River; a number of sites can be found just before crossing the river: Loddon River; Philps Creek Lake Vera - a number of suitable sites are located along the track a short distance after crossing the bridge near the hut; and Lake Tahune. Accessible from A10, Lyell Highway. The Frenchmans Cap bushwalk is a challenging walk in a harsh part of Tasmania exposed to extreme and changeable weather conditions at any time of the year. Anyone camping in this area must be fully self-sufficient and experienced. Frenchmans Cap is a well-known mountain in the Franklin Gordon Wild Rivers National Park, West Tasmania, Australia. It lies east of the West Coast Range, and south-west of the Cradle Mountain Lake St Clair National Park. The track is rough and muddy over extended sections, especially across the Loddon Plains.